"We humans have a long history of using writing instruments to record and transfer our thoughts and impressions. We magicians have a long history of gimmicking writing instruments to deceive thoughts and create magical impressions". This ebook is a combination Do-It-Yourself and Magic Effects ebook, containing 9 major DIY projects and 7 full working routines, plus a host of other tricks. Learn how to make 3 types of flash pens, a flameless, smoke loading pen, a PSI pen, multiple-purpose pens, novel uses of off-the-shelf pens and mentalist utility pens. No knowledge of electronics needed --- just the proper know-how. Each low cost project is followed with a corresponding chapter on how to use your gimmick pen in a true, tried, and tested magic effect. This ebook is jammed packed with over 150 color photos, 13 detailed illustrations, numerous diagrams, 11 instructional video links and up-to-date listed sources for materials. Why pay $150 dollars for a PSIpen when you can make your own for less than $8.00? Or make a durable flash pen for under $10, or a non-flame, smoke pen for $20? Most of the book's gimmicked pen projects can be made in 30 minutes or less with house-hold materials and at a fraction of the retail cost. 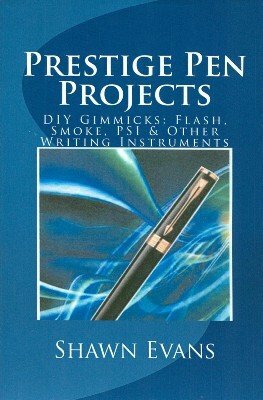 If each of the pens and effects in this book were sold separately at market value, the total price would exceed $900! 1st edition 2012, 155 pages.